Arthritis can present as a significant problem to exercise inclined individuals. Arthritis may be a natural progression of aging, be part genetic, or post-traumatic in origin. A frequent question with individuals who have joint arthritis is, what exercises can I do? This is a complex question, the answer often beyond what most people wish to hear. Simple answers with a structured response such as type of exercise, frequency, and duration are desired. However, those inclined to have the most optimal response, deserve an optimal answer. It is complicated. Preexisting joint pathology, coexisting disease states, exercise tolerance and goals all influence decision making. For example, knee joint pathology may affect biomechanics of gait and weight bearing surfaces of the tibia, femur and patella. Different exercises will impact these loads. Excess weight imparts more joint load. Medical disease states that negatively affect health alter body inflammatory responses. Knee joint loading from dynamic exercise results in favorable responses to cartilage, while excessive loads promote degeneration of joint cartilage. Individualized exercise prescriptions and custom specialized bracing can be used to direct loading and unloading of joints. 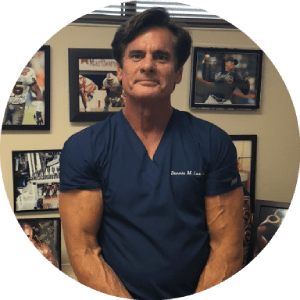 Dennis M. Lox, MD, a Regenerative and Sports Medicine specialist in the Tampa Bay Florida area, has extensive experience in therapeutic exercise. Dr. Lox is a board certified Physical Medicine & Rehabilitation physician. Dr. Lox has been practicing in the Tampa Bay are for over 20 years, with main treatment office in Clearwater Florida. The prevention of arthritis progression versus rehabilitation of joint function in post surgical, or nonsurgical regenerative alternatives such as Biological therapy, Platelet-Rich Plasma (PRP), and Stem cell Therapy are often not understood in context or goal setting. An analogy to this dilemma, how many miles can you put on your car tire in varying driving conditions before your tire has a blowout? Driving to the grocery store does not equate to off road endurance stresses at equidistances on two different types of vehicles with or without different sets of tires. Humans are much more complex. Understanding various factors with each individual is necessary to confront the exercise and arthritis issue with a goal of prevention and maintaining the highest level of athletic participation possible. Sometimes a simple answer can be found by guidance from an experienced expert in a complex question.